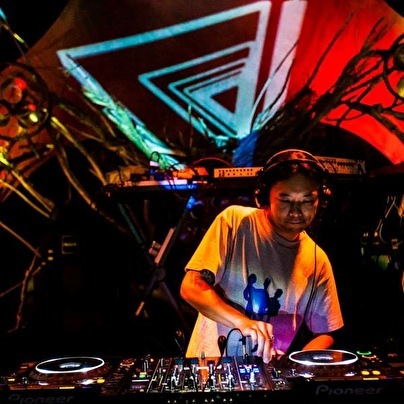 Yuta started his career in 2004 as a key person in Japanese Goa/Psychedelic trance scene and sparked the Goa Trance revival of Japan. He is active not only as a DJ, but is also well-known as an organizer, label A&R, and booking manager. He approaches the Nu Goa/Acid trance and techno sound from many directions to reach his audience's spirit with depth. Yuta works alongside the great DJ Tsuyoshi Suzuki at Matsuri Digital to deliver the Nu Goa Sounds from Japan to the world as psychedelic art and as an icon of the party scene in Japan. Since September 2016, Yuta started the new psychedelic techno label Liquid Drop Groove, whose concept is "A ripple-like space and soundwave that a single drop brings to the water surface." In addition to his work with Matsuri Digital and Liquid Drop Groove, Yuta is supporting and producing a number of parties domestically and worldwide. He recently formed his new project, Matsuri Beats Booking Agency, and as a DJ/Artist himself Yuta is signed to Sonic Bookings in Israel, in addition to becoming a member of Marcus Henriksson (Minilogue)'s agent Reshape Booking Agency in Sweden. As a DJ, Yuta is performing energetically at everything from big-name festivals to underground parties, such as Nagisa Music Festival, Harukaze, Mother, Re:birth Festival, rural, Space Gathering, Mind of Vision and Dommune in Japan. Additionally, he has played in Mexico; Goa and Bangalore in India; Shiva Moon & Black Moon After in Koh Phangan, Thailand; Eclipse Festival in Indonesia and Australia; Return to the Source in UK; VUUV in Germany; Transylvania Calling in Romania; Y-Productions in Hungary; Nova's Incident and Old is Gold in Belgium; Psy Fi Festival in Netherlands; Woodstower Festival in France; Neverland festival and Psilosiva in Israel, and others. Yuta's stable and unique DJ style has received positive feedback from the local and international party crowd. Di.fm and Dice Radio have also featured Yuta and brought him attention from a borderless audience. In May 2015, Yuta released a compilation album Matsuri Tribe, which includes tracks from number of artists whose fame rings around the world, as well as Yuta and Asteroidnos aka Makio's joint project "Rezonance Mood". As Rezonance Mood, he creates music with analog synths and proposes a new sound that fuses the Techno groove and Goa sound. Summer of 2017 Yuta have gig from OZORA; Hungary, OREGON ECLIPSE; USA, ZNA; Portuguese, VOV; Germany and many more. Also soon few title release from 2 kind his labels. Having travelled alone in Asia and reached the realization that 'Life = psychedelic", he is on a mission to continue his work with the concept of 'reforming consciousness."